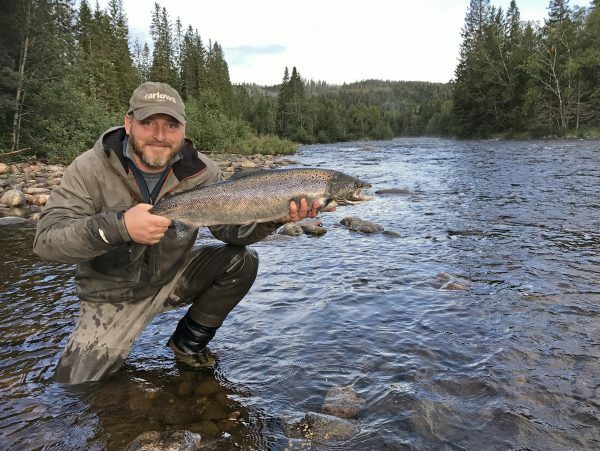 MORTEN HARANGEN | Fly fishing around the world! Bring it on, 2019! I look forward to a new flyfishing year, which for me commences on February 1, attending the River Dee opening in Scotland. I’d like to take this opportunity to wish you all a Happy New Year and tight lines, wherever you are and wherever you fish. Stay safe and remember: Piscator non solum Piscatur. Frank Sawyer bandt seg inn i fluefiskehistorien med sin eminente fasanhalenymfe. Med sin nysgjerrighet, analytiske evne og nyskapende grundighet, maktet han å bringe arven fra 1800-tallets pionerer videre. Bøkene til River Avons mest berømte riverkeeper burde være pensum for enhver fluefisker. 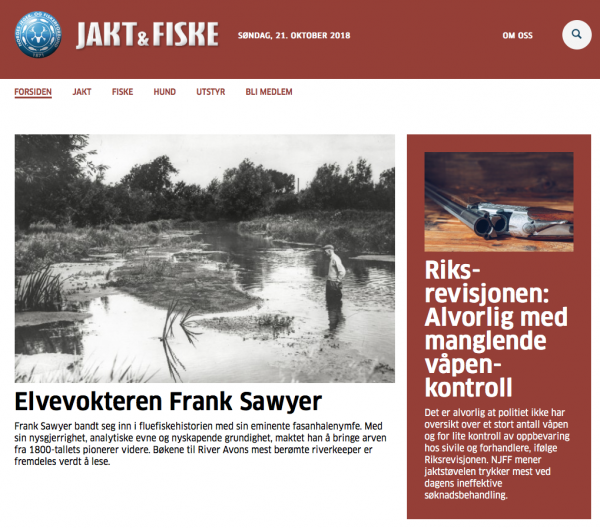 Nå kan du lese min historie om Frank Sawyer på nettsiden til Jakt og fiske. God fornøyelse. What a strange year it has been. 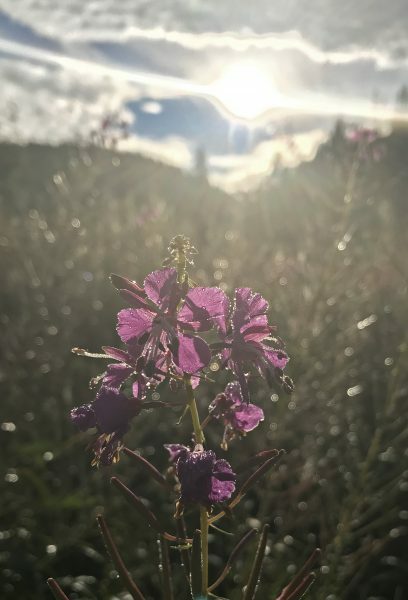 After the coldest and most snowy winter I can remember, we got the summer we hoped for – and more. Many salmon rivers have been extremely low and warm, some were even closed for a period of time, in order to protect the fish. Some of us still managed to connect with the odd salmon, and here is a review of my season – month by month. Hope you enjoy it. Feel free to leave a comment or feedback. January was bloody cold. The incredible amount of snow coming down was rather frustrating, even though it reminded me of my childhood winters. The only sensible things to do were reading books, go skiing and looking forward to fishing the Dee. 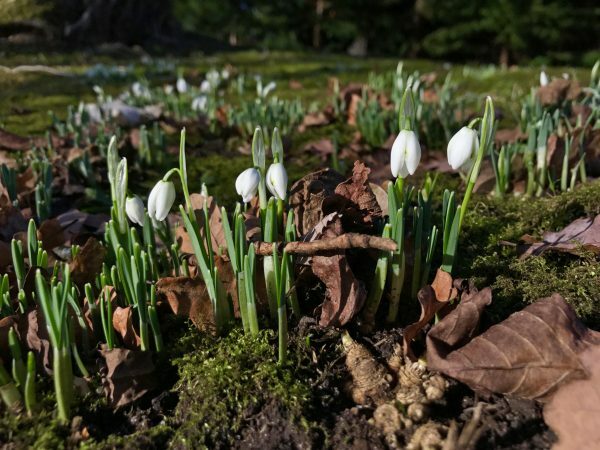 February 1 was the magical date, when my brother Terje and I were going to kick our season off – several weeks before we usually do. We did not expect anything really, but freezing our nuts off and maybe – just maybe – connect with a fish. 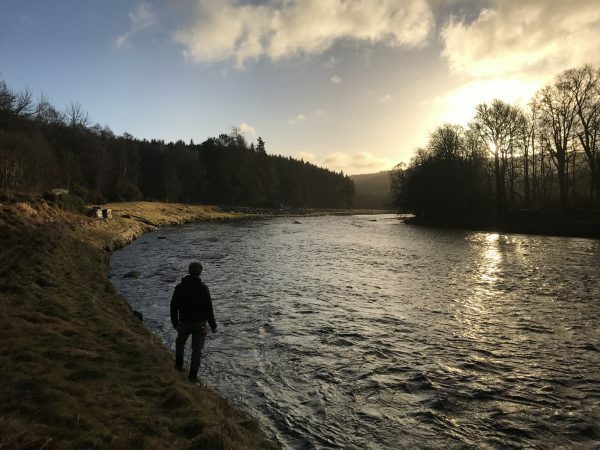 But, as the opening day rapidly approached, we agreed on a plan (I’ll come back to that) which could possibly increase our chance to catch a springer – the finest specimen of salmon I know. 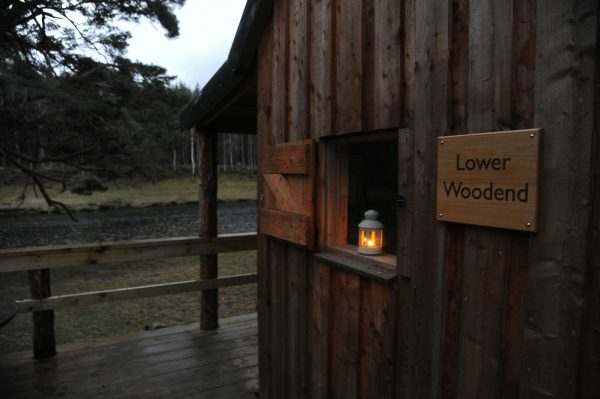 So, on January 31 we boarded a plane to Aberdeen and got settled at the lovely Banchory Lodge. That evening, I was doing a talk at the local Orvis shop. Good turn up and great fun. February 1 came early. 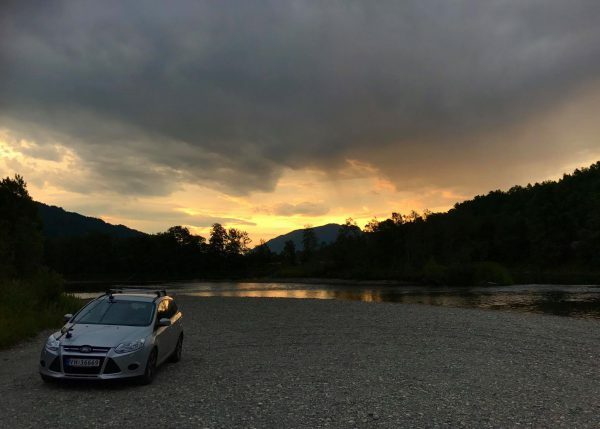 I believe we got up at 5.30 am, in order to prepare, have breakfast and be on the river at 7.30 am – before anyone else. Fishing a pool that hasn’t been disturbed, do increase your chance of catching a fish. So, that morning, just as the sun worked its way up, we met proprietor Michael Buchan at the Lower Woodend beat. We got our rods up, lit the fire in the fishing hut, had a coffee and then blessed the river. At 8 am, we started fishing – just as we’d planned! My brother worked his way down the lovely Hut Pool, while I covered the smaller pools further downstream. 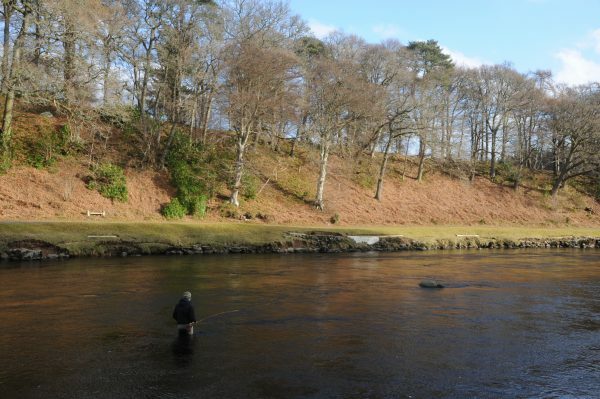 We had an hour or so of fishing available, before we were to attend the opening ceremony at Banchory Lodge. To cut a long story short, Terje was soon into a fish. 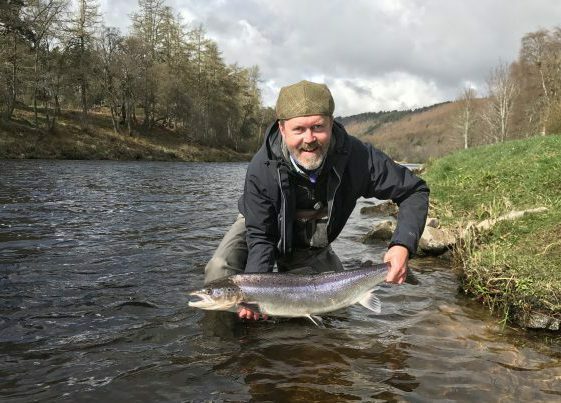 It took a Gold Willie Gunn about half way down the pool, and after an enjoyable fight, he landed a beautiful 8-pounder – the very first Dee springer of 2018. After the ceremony, where my brother was presented with a nice bottle of malt for his fish, we returned to Lower Woodend. 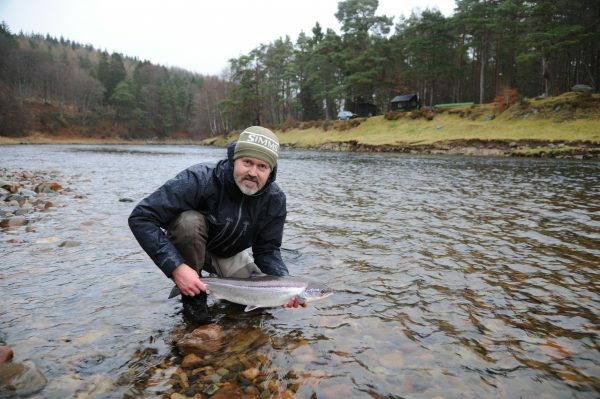 After having landed a kelt, I managed to catch a springer, too. I picked it up from the very last pool on the beat, on a Tosh, if I remember correctly. So, the opening day on the Dee turned out to be a successful one for us both. Around 6 pm we packed up and drove back to Banchory Lodge, having a proper meal and a few drams. We did fish the following day, as well, but did not touch a thing. Part of the reason, was the fact that we enjoyed most of the day relaxing in the sun, soaking in the sense of spring. At the time, there was still a lot of snow back home in Norway and I believe it was then – exactly then – we decided to return for opening day next year. We’d just got home, when I noticed a Facebook competition where the prize was two days fishing for two rods….on the Dee! I entered, not expecting to win, and quickly forgot about it. Then, one Saturday morning, I had an email congratulating me on winning the bloody thing. Now what? With the two fishing days being no more than a couple weeks away, it took some effort to clear our calendars and get a flight booked. But both Terje and I worked it out, and suddenly we were back on the Dee! 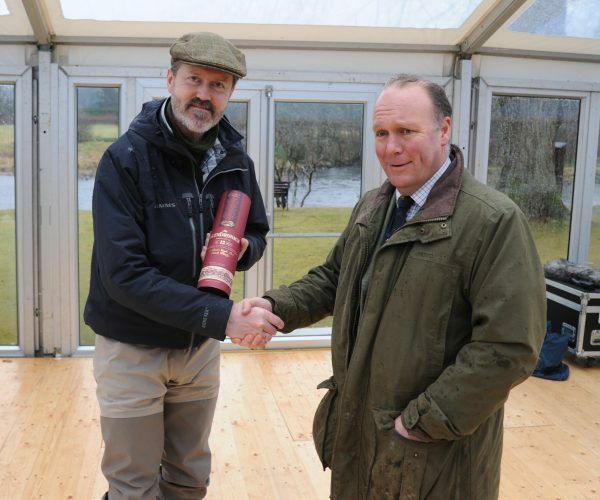 The prize included a stay at the wonderful Tor Na Coille Hotel, just outside Banchory, and fishing a beat just across the street: Little Blackhall and Inchmarlo, where Martin Robson is the ghillie. If opening day was cold, late February was freezing! Apart from a kelt, nor my brother or I had any particular action. But the beat was lovely and our company brilliant, so we thoroughly enjoyed our bonus days in Scotland. 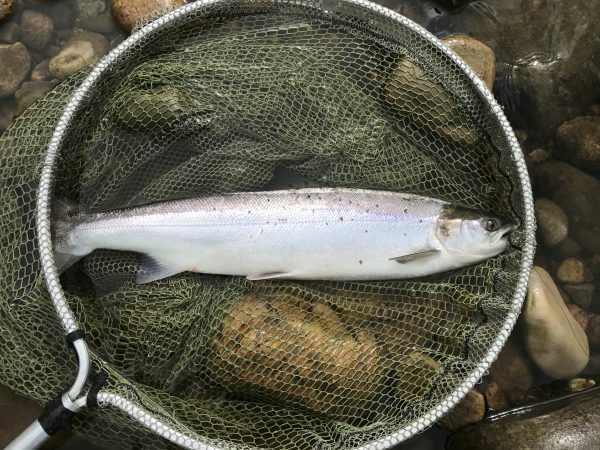 When a fellow angler hooked, played and landed a lovely 17 pound springer, too, it just could not be any better. So I’d like let to take this opportunity to once again thank Corin @ the Wild Rise Company for this lovely surprise, to the Tor Na Coille Hotel for a very pleasant stay and to Martin Robson for working so hard, in order to get us into a fish or two. Don’t be surprised if we come back one day (warmer). March wasn’t an interesting month in terms of fishing. 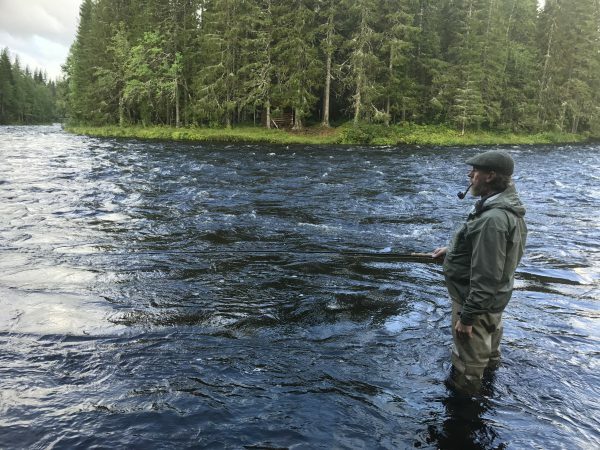 While anglers in Scotland can go fishing from January to November, the salmon fishing season in Norway is rather limited. So unless you like ice fishing or go fishing in the sea – which can be great fun – March is the perfect month to book a trip to Italy, Spain or Greece, just to get away from the winter for a few days. That is basically what I did, accompanied by my girlfriend. We had a wonderful time along the Lake Garda and eating our way through Parma. Highly recommended. Also, March is a month where I do quite a lot of talks and write various fishing articles, so I’m usually quite busy. If you are member of a fishing Club, run a store or know about events where a talk may fit in, do get in touch with me. 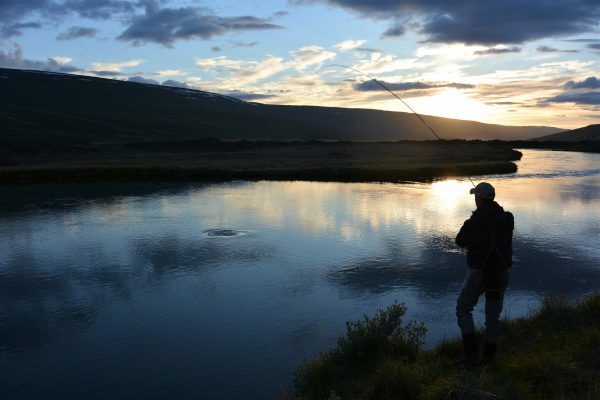 Trout, seatrout or salmon – Scandinavia, Europe or the US – it is up to you. My talks cover it all. April is a highlight of my flyfishing season. 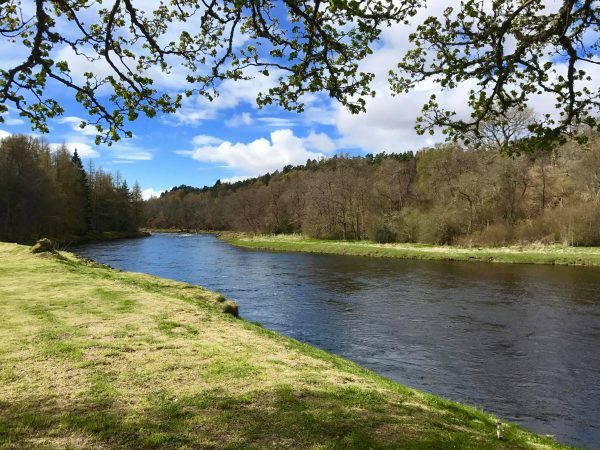 Our annual trip to Scotland’s famous River Spey has become a very dear tradition, much because of the fine company of great fishing chums from England. 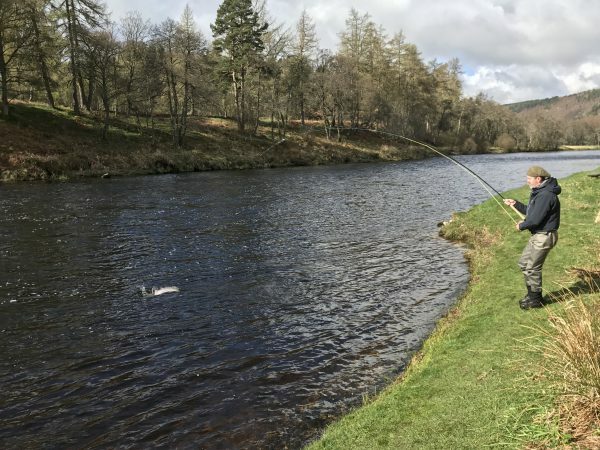 In late April, we fish the lovely Ballindalloch beat, upstream of Aberlour, and this year was among the better ones, if you look at the number of fish caught. When meeting up with our ghillie Steve Brand on Monday April 23, the river was on the high side after a period of rain. But it was dropping – and throughout the week, it kept dropping towards perfect conditions. So, our party was optimistic and our efforts were rewarded. On Tuesday evening, just before I was returning to our house, something big grabbed my fly. It wasn’t a textbook pull, my Cascade tube just stopped – and then nothing happened, until I slowly lifted my rod a few seconds later. Was it still there? Hell yes! The fish was heavy and took off towards the far bank, where it stopped just a few inches from the grass. I tried to make it move, but it would not leave whatever safe spot it had found. So there we were on each side of the river. My bent rod attracted the attention of people driving along the Spey, and we slowly, but surely built up an audience. After a little while of putting significant pressure on the salmon, it decided that enough was enough. It moved upstream, then turned downstream. I could feel how it shook its head – and suddenly the hooked slipped. No great surprise, but still disappointing. For the crowd, the show was over. For me, it was time for a GT. And to speculate how big that fish was. As the river dropped away, we had our fair share of action. Another member of the party, landed 3 springers in the 7 to 8 lbs range. My brother caught the best fish of the week, a lovely 14 pounder which took a Posh Tosh, fished rather deep. It put up a serious fight, but was luckily hooked right in the scissors and it was just a question of time before we could net him. I made up for the giant (I am sure it was!) lost, when I got a beautiful 7 pounder from the Junction Pool. It took a small, slim brown and black tube fly. Junction, where the Avon joins the Spey, is my favourite Ballindalloch pool. I have been caught most of my Spey fish there (not that many, but still…), and it seems a fairly safe bet on most heights. Having said that, the whole Ballindalloch beat is a pleasure to fish. The pools vary in size and characteristics, but each and every one of them are very attractive, from a salmon angler’s point of view. 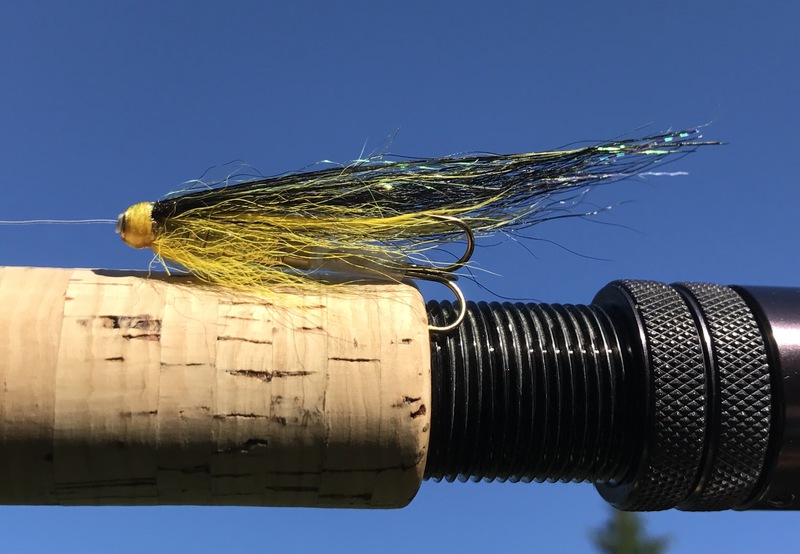 To be able to fish Ballindalloch is a great privilege, especially in the colorful spring, with dafodills everywhere, pheasants running around and watching the wonderful trees getting greener day by day. If it is warm enough, it’s quite enjoyable to have a pint on the river bank, too. That, my friends, is the recipe for a great day! May is the first proper spring month in Norway. The lower part of my local salmon river opens for fishing, but in May, I focus on trout fishing. There are several nice lakes in Lardal, the area where I grew up, which can offer good sport. My flyfishing season is simply not complete without a couple of trips up there. But this year, in late May, I also went to Hampshire, England, to visit friends. I had of course brought my travel rod, and managed to squeeze in some chalk stream fishing, too. 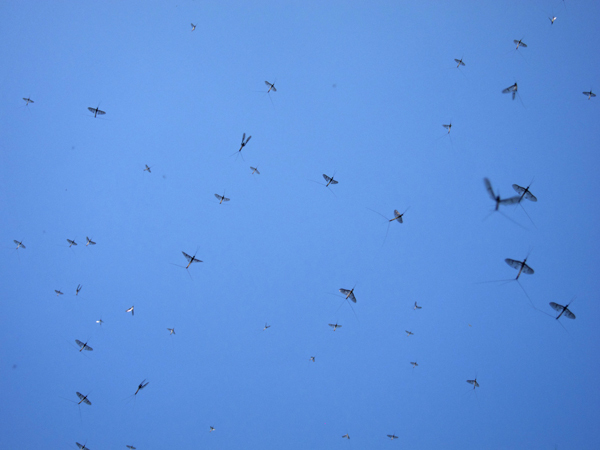 As I am sure you know, late May is prime time on the famous chalk streams, as the mighty Ephemera danica – the Mayfly – hatches in big numbers. 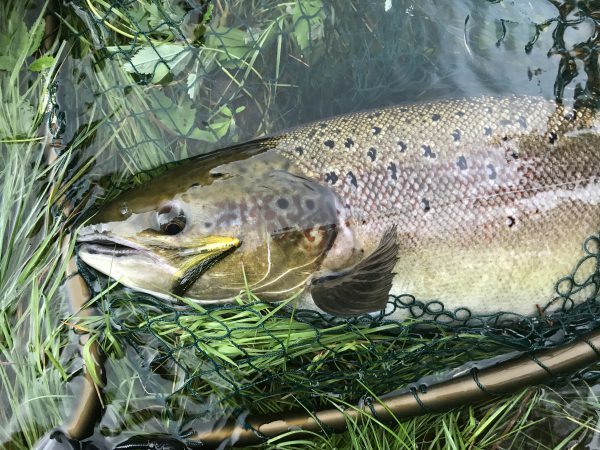 I sure had some funs, with a mix of rain and sun, and excellent sport in both the Itchen, upstream of Winchester, and the Test, fishing around the lovely village of Stockbridge. June continued as hot as May had been. So far, we all enjoyed it. 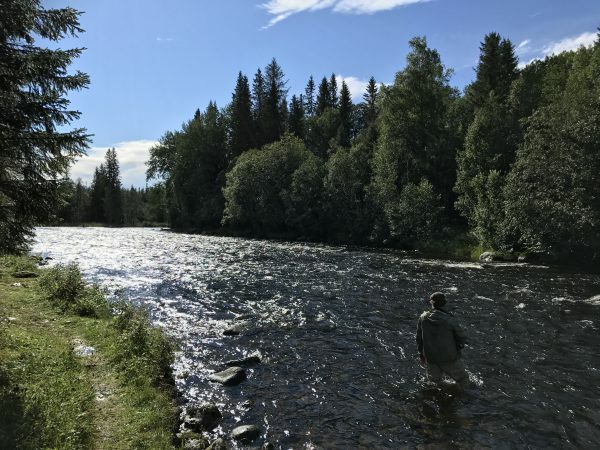 On June 10, the upper part of my local salmon river, the Numedalslågen, opened and I had booked a beat for myself on June 14. 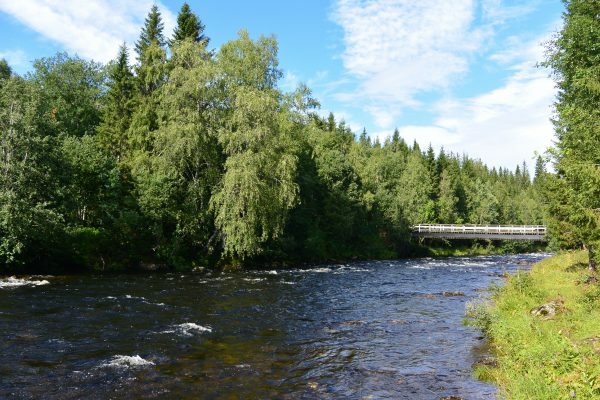 The Numedalslågen is a late river, and the best part of the season is usually from mid July onwards. So it was a pleasant surprise when I connected with a fish after just a few casts. It was not the biggest fish in the world, but a grilse of about 5 pounds is most welcome. The weather was horrible, with heavy rain and strong winds, obviously making the casting a bit difficult. But I didn’t give up and an hour later, I was into another fish. But this one behaved very strangely, and when showing on the surface, I realized it was a pike. A few seconds later it released itself, taking off with my leader and the fly. Later that month, I was back on the river, fishing a pool called Stubben. Once a favourite of the Victorian anglers. There were plenty of fish about, but the river was low and warm. I didn’t have a pull, nor had the other anglers, who were spinning and worming. 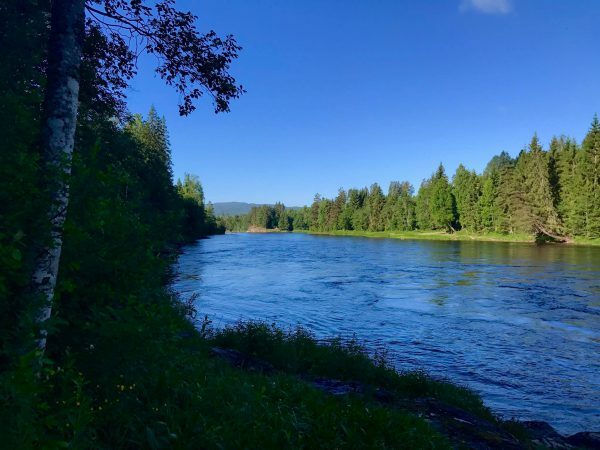 Reports coming in from other Numedalslågen beats and other rivers in the Southern part of Norway, told about similar conditions. It was obvious that we needed rain. Quickly – and a lot of it. But our prayers didn’t help much. We hardly got a drop and while most people were thrilled with the extraordinary weather, the fishing became poorer and poorer – and our rivers were more suitable for bathing than fishing. I had to reconsider my fishing plans for July. July came and nothing changed. I cancelled my fishing on three different locations, including Scotland. I must admit I found the regulations that were introduced on some rivers, following the drought, quite strange. Is it wise to practice catch and release in rivers where the water temperature exceeds 20 degrees? Not in my book. If you play a fish until its exhausted, it will most likely die if you put it back. 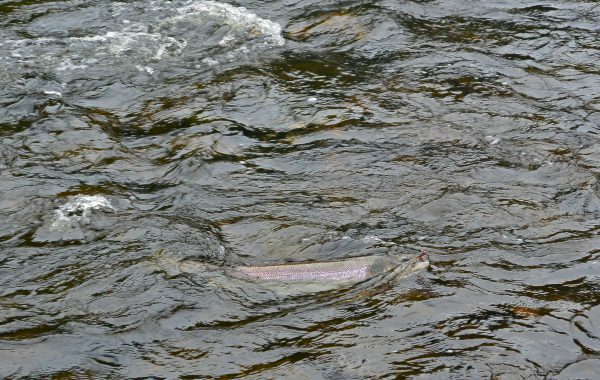 If one truly cares for the salmon, it is better to either allow the angler to kill a fish – and then stop fishing for the rest of the day – or to simply close the river for fishing until the conditions improve. 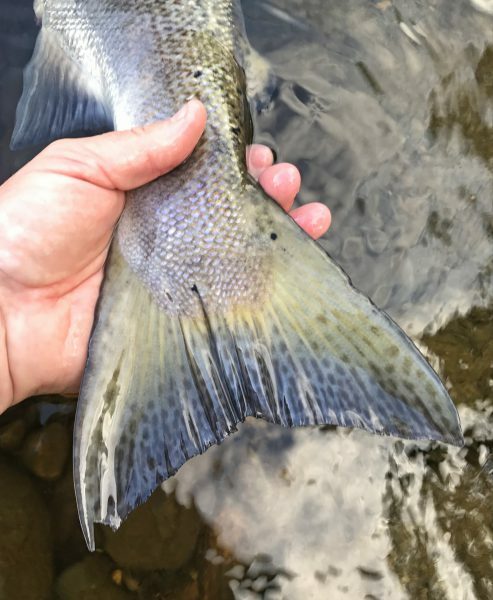 But, unfortunately, some river owners and estates introduced mandatory catch and release as the appropriate “answer” to the unusually dry conditions. Kudos to those proprietors who went the other way. August turned out to be the month of change, at least for me. It started as hopeless and dry as May, June and July all had been. Our annual trip to the famous Lærdal wasn’t very successful. 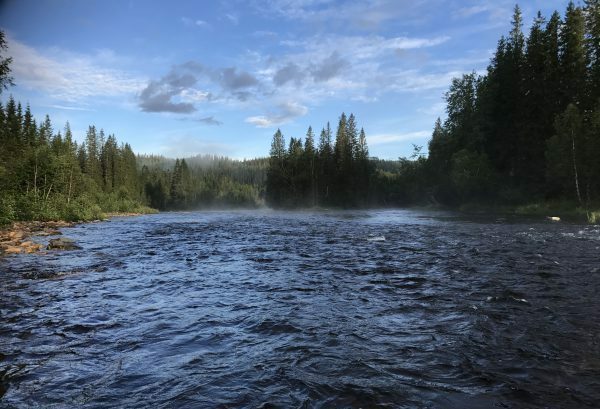 But I can not imagine a more beautiful place on Earth not to catch fish :) The steep, dramatic mountains and wonderful river, with its clear and green-ish water, should be on every flyfisherman’s bucket list. 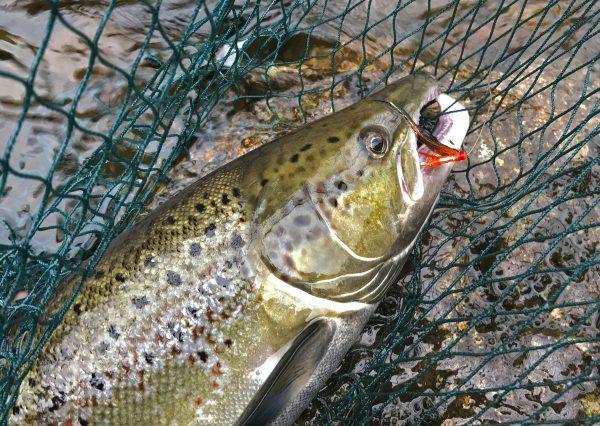 Going to the Lærdal in August means you can fish both for salmon and huge seatrout. But here, as in so many rivers this year, the catches have been rather disappointing. We did not see many fish and, as one would expect, we did not connect with a single one. Having said that, we only fished for a couple of days and the chaps who remained for the full week, eventually caught a few seatrout, including one weighing about 8 pounds. 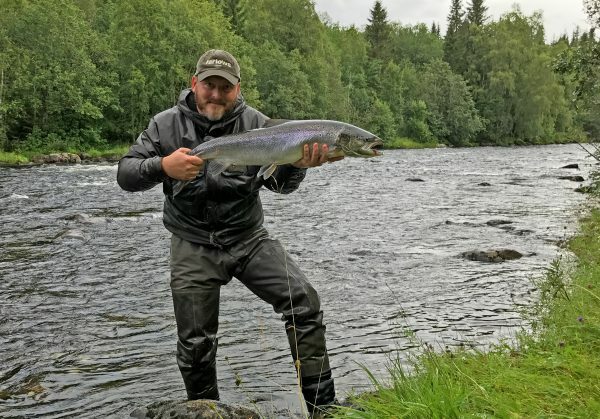 I shall not bother you with my last attempt to catch a proper Numedalslågen salmon, but instead tell you about the most successful salmon fishing trip of my life! I have never experienced anything like it and I may never experience anything like it again. 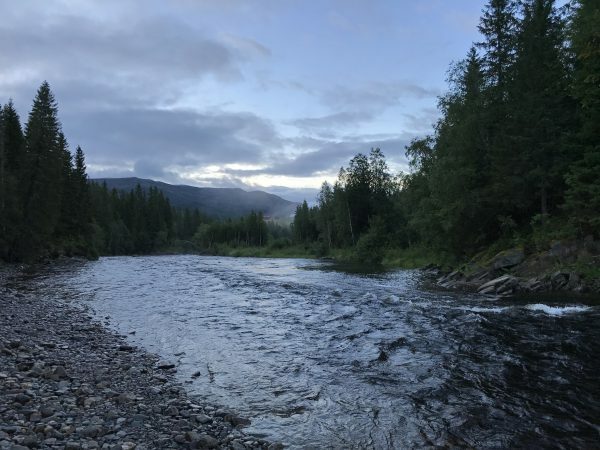 But I will certainly treasure the memories of my three excellent days on a small Trøndelag river called the Søråa. This is a tributary of the Bjøra, which again is a tributary of the mighty River Namsen, which I am sure needs no further introduction. When my chum Øystein and I arrived at Raaum farm in Høylandet, on August 16, the long awaited rain had finally come. It had actually been pouring down, and the Søråa had transformed from…nothing…to a powerful river, with lots of fish running. We realized that we – at last – were at the right place at the right time. Anything could happen – and it did. That first afternoon, following setting up the camp and having an early supper, I had two grilse and two seatrouts, plus a few pulls. No big fish yet, but judging from all the salmon we’d seen, it was obvious that our chances of catching a good fish or two, was better than in a long, long time. The next morning, I was up at 4 am. I was too excited to sleep and I just love fishing in the mornings, when the sun rises and everything comes to life. It did not take long before the action begun. An absolutely crazy 13 pounder grabbed my blue and black tube, and gave me one of the most memorable salmon fights I’ve ever had. It came out of the water over and over again, and made several attempts to leave the pool, which I just had to stop – beacuse following the fish downstream was impossible. Fortunately, the angry salmon was well hooked and I finally managed to bring it in. Wow! Later on that day, following breakfast and a power nap, I had a similar fish from another pool. When Øystein also caught a fish about 12 pounds, the day is complete. But it did not stop there. On the contrary! 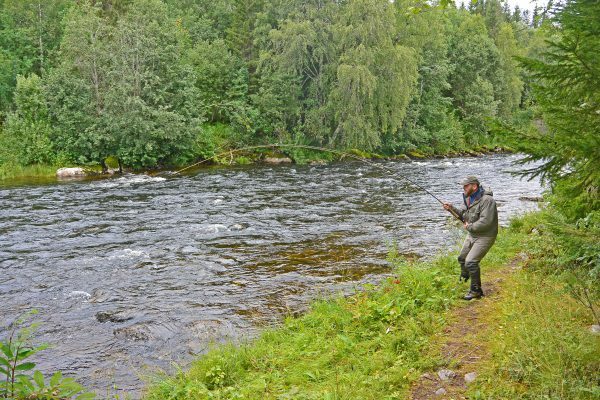 Before we returned home, I alone had landed 11 grilse and salmon, plus five seatrout, and I am sure I had +/- 30 pulls. What a fantastic end to my salmon fishing season. September is here. I like the autumn, with the crisp air and wonderful colors, but its also a little bit sad. Numedalslågen has closed for fishing. My brother and I usually do a trip to Scotland in the autumn, but not this year. 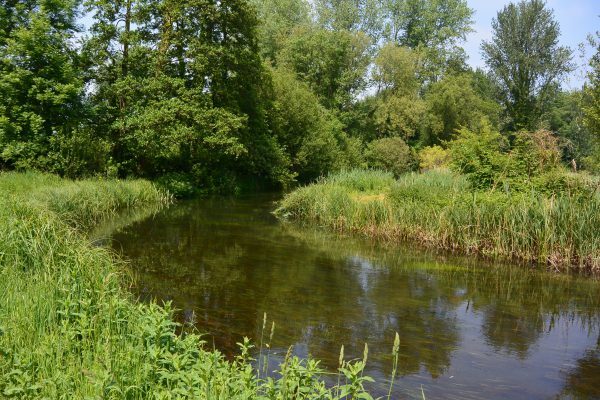 Instead, we’re soon off to Hampshire again, to fish a bit and to celebrate a friend who’s about to retire as riverkeeper on the Test. Looking very much forward to that. Then, we have to start planning our 2019 season, which I hope will bring some more rain than we had this year. If not, well, we’ll just have to make the most of it, don’t we? To those of you who still have some fishing to do in 2018: Tight lines. Det smakte godt. Virkelig godt! Etter årets varme og tørre sommer, med lave elver, badevannstemperaturer og håpløst laksefiske, løsnet det endelig. I tre dager til ende opplevde kompis Øystein og jeg et drømmefiske etter laks. Vi var for en gangs skyld på rett sted til rett tid. Her følger en rapport – i ord, bilder og video (helt til slutt) – fra årets tur til Raaum-valdet i Søråa, på Høylandet nord i Trøndelag. – Jeg tror dere kommer til å få mer enn litt action, svarer Kay – med etternavn Haug. Sammen med kona Maren driver han gården Raaum, like nord for Høylandet sentrum. Søråa-turen er like rundt hjørnet, og værmeldingene fra Yr og Storm følges fra time til time. Regnet har omsider kommet til Trøndelag, men jeg er bekymret for at det skal gi seg et døgn eller to for tidlig. I en melding til Kay skriver jeg at løftet i vannstanden iallefall betyr at ny fisk kommer opp og at vi sikkert får litt action… Han mener imidlertid det ikke er noen grunn til bekymring. Det skal vise seg at det har han helt rett i.
Bjørka – en giftig plass! 16. august venter Øystein og sønnen Martin på Værnes. De har kjørt den lange veien fra Skien, og tilbrakt natta på hotell. Jeg kommer med Norwegians morgenfly fra Gardermoen, og det tar ikke lang tid før vi alle sitter i bilen, på vei nordover på E6. Etter en rask stopp i Steinkjer, med bunkring av diverse nødvendigheter, bærer det videre til Høylandet og desinfisering av utstyret på den lokale bensinstasjonen. I 13-tiden er vi på plass ved campen, hvor vi pakker ut, rigger utstyr og spiser – før vi begynner å fiske. Forholdene virker lovende og vi er ivrige. Det er skyet, regner litt og vannstanden er fin, med ca 25 kubikk. 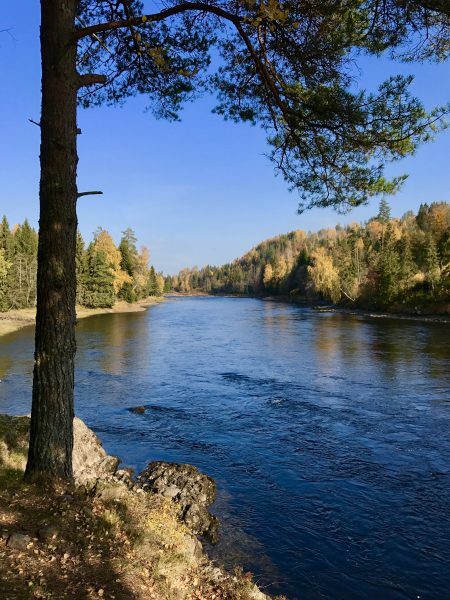 Mens herrene fra Telemark starter ved den sagnomsuste bjørka og i Arnes kulp, går jeg ned til Besa. Gutta som fisket Raaum før oss fortalte nemlig at de hadde tak i flere laks i Besa, uten at noen satt. Nå har hølen fått hvile noen timer, og det bør være en fair sjans for å komme i kontakt med fisk. Og det tar ikke lang tid før den første fisken sitter. Ingen kjempe, akkurat, men en sjøørret på drøye kiloen er uansett velkommen. Det skjer ikke noe mer i Besa, og jeg fortsetter ned til Hjelkdalen. Jeg tar sjansen på å vade ut på en liten grusbanke i svingen helt øverst på den fiskbare strekningen, slik at jeg får fisket den dype yttersvingen på en fornuftig måte. Og jammen klarer jeg å friste en fisk der også. Allerede på det tredje kastet strammer snøret seg og en smålaks på 1,8 kilo varter opp med ordentlig motstand, før den ender i håven. I hovedhølen er en og annen større laks oppe, men jeg kjenner ingenting. Verken på den blå og svarte monkey’en som så langt har fungert strålende eller på noen av de andre fluene jeg prøver. Men vel tilbake i Besa, blir det en ny, liten laks. 1,2 kilo denne gangen, tatt på en liten gul og svart dobbeltkrok. Så følger sjøørretene på rad og rekke. Ingen store, men store nok til at jeg legger meg svært så tilfreds. For en start! Det må jo være et tidsspørsmål før laks av litt grovere kaliber tar fluene våre?!? 17. august er jeg tidlig på beina. Det har regnet godt i løpet av natta, men i teltet var det heldigvis tørt, varmt og trivelig. Det er ingen tegn til liv i hytta, og jeg tar på vaderne, mens jeg vurderer hvor jeg skal begynne. Siden jeg regner med Øystein og Martin gjerne fortsetter ved bjørka og i Arnes kulp, rusler jeg ned til Hjelkdalen. Jeg er på plass i fem-tiden, og bruker det første kvarteret på å observere. Et par, tre fisk viser seg i sømmen mellom hovedstrømmen og bakevja på motsatt side – ellers er det stille. Vannstanden har økt med ti centimeter siden i går, og jeg tar ikke sjansen på å vade ut til den lille grusbanken oppe i svingen. Til det er strømmen for hard. Resten av hølen fiskes derimot grundig og systematisk, fra topp til bunn, med ulike fluer – uten respons. Hjelkdalen får hvile. Det er en perfekt morgen, med en fin temperatur, et lett skydekke og knapt vind. Regnet har tatt en pause, og vi har nok av flotte høler å fiske i. Jeg fortsetter opp til Besa, som med sine 25 kubikk ser ordentlig giftig ut. Med en liten blå og svart tube dinglende i enden av spissen, har jeg virkelig trua. Allerede på første kast røsker en fisk tak i flua. 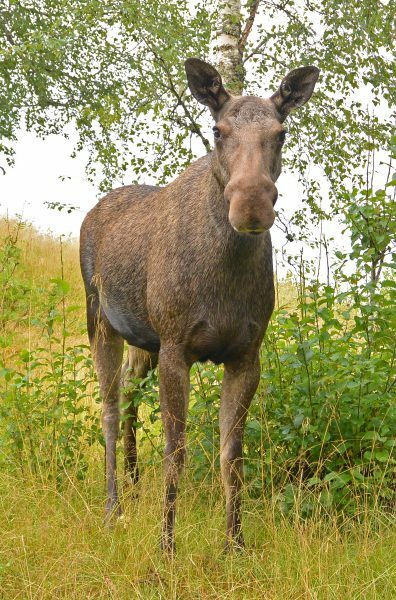 Det som antakelig var en sjøørret lar seg riktignok ikke kroke, men det er uansett lovende! Enda mer skjerpet kaster jeg meg nedstrøms, meter for meter, og det går ikke mange minuttene før jeg har kontakt med en god fisk – midt i elva. Et kort, deilig laksedrag, denne gangen. Kroken sitter og kampen er i gang. Laksen byr på solid motstand. Jeg kommer meg på land, og klarer flere ganger å tvinge fisken relativt nær. Men den har plenty krefter på lager, og forsvinner gang på gang over i renna på den andre siden. Jeg føler meg relativt trygg på at kroken sitter godt, og fortsetter å legge maksimalt press på laksen. Skulle den finne på å vende snuta nedstrøms og lykkes med å forlate hølen, har jeg ikke sjans til å henge på, så det får bære eller briste. Etter sju, åtte minutters krangling, merker jeg at fisken er i ferd med å få nok. Den store halen kommer til syne flere ganger, og selv om laksen gjør et siste utras, makter den ikke ta noe særlig line. Kampen er straks over. Til slutt bikker fisken over på siden og sklir inn på bredden. Vekta stopper på 5,8 kilo. Herlig! På formiddagen begynner det å regne igjen. Jeg tusler ned til bjørka, i håp om å lure en laks til. Elva har stabilisert seg, iallefall for en stund, og forholdene bør være optimale. Jeg skal ikke kjede dere med alle detaljer, men i løpet av relativt få kast sitter’n igjen. 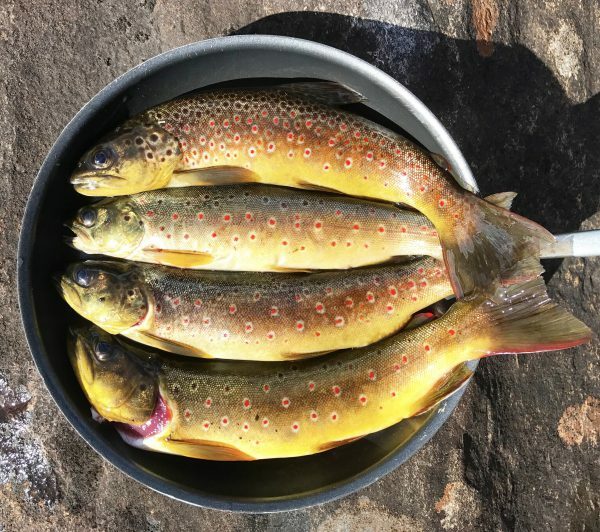 I blankvannet rett utenfor bjørka, stopper flua brått og det tar ikke mange sekundene før jeg skjønner at jeg har kroket en ny pen fisk. Fantastisk! Denne laksen har ingen intensjoner om å bli ved bjørka. Etter å ha kastet seg i været, uten å bli kvitt flua, setter den kursen nedstrøms. Jeg følger etter, etter beste evne, over glatte steiner og lumske hull i elvebunnen. Elegant er det ikke, men jeg klarer å unngå å tryne. Så vidt! 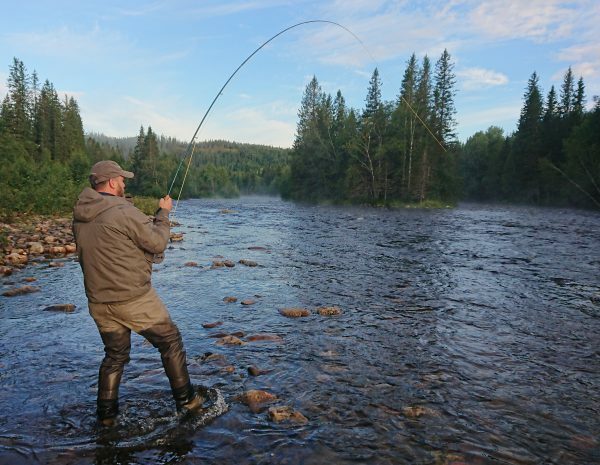 Heldigvis stopper fisken i hølen utenfor campen, og der får jeg sakte, men sikkert en slags kontroll. De neste minuttene føres en slags stillingskrig. Jeg vinner en meter eller to, laksen svarer og returnerer til renna den står i. Slik holder vi på noen ganger, før den omsider blir mer medgjørlig. Fisken er blankere enn den jeg tok på morgenen og veier 5,5 kilo. 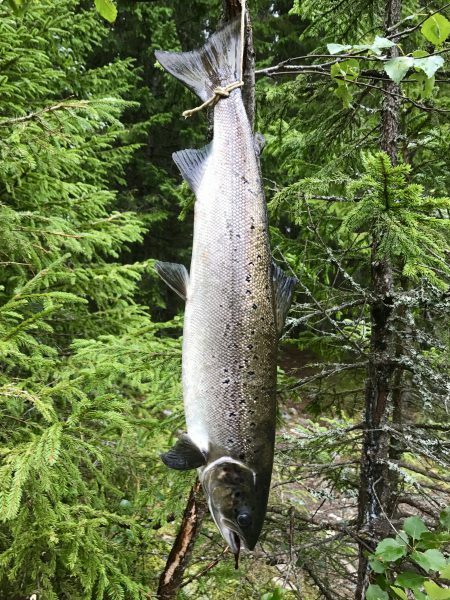 At Øystein senere på dagen lander en kubbe på 5,6 kilo ved den samme bjørka gjør en allerede flott dag helt fullkommen. Så bærer det opp på gården for et par fredagspils med Kay og Maren, familien deres og andre fiskere. En virkelig trivelig stund på verandaen på Raaum. 18 august blir en ny eventyrlig dag i Søråa. Da jeg kryper ut av teltet i fem-tiden, er sola på vei opp, himmelen rosa og lufta så klar, så klar. I natt kan det ikke ha vært mange plussgradene… En nydelig august-morgen, rett og slett. På vei ned til Besa, fisker jeg raskt gjennom Arnes kulp, men jeg verken kjenner eller ser laks. Pussig. Vi tok flere laks og sjøørreter der i fjor, men i år er det dødt. Vel framme ved Besa, tar jeg en kaffe før jeg starter. Som vanlig plasker det fisk i strømkanten mot bakevja på den andre siden, men fokus i dag er hovedstrømmen, der jeg tok fisk i går. En liten oransje og svart tube er dagens flue, så får vi se om den faller like godt i smak som den blå og svarte gjorde i går. Det er en magisk morgen. Disen ligger over elva, det er helt stille og over hodet mitt svever to ravner. Jeg er privilegert, tenker jeg, i det jeg legger det første kastet skrått nedstrøms og mender oppstrøms. Flua lander en meter inn i bakevja. Strømmen griper tak i snøret og flua krysser elva i akkurat passe tempo. Ikke for raskt og ikke fort raskt. Men responsen lar vente på seg. Et par skritt og et nytt kast. Stille. To nye skritt, før tuben sendes ut på en ny luftetur. Da smeller det. Omtrent ved den samme steinen der jeg tok laksen i går, stoppes flua brått. Ikke noe klassisk drag denne gangen, men fisken sitter. Og den er morgengretten! Gang på gang varter den opp med luftige svev, og selv om det forsåvidt er moro, gir det også grunn til bekymring. En slik reaksjon kan jo bety at fisken er dårlig kroket. Men enn så lenge har vi kontakt. Etter noen minutters fight, mobiliserer plutselig laksen det den har av krefter og setter kursen nedstrøms. Det hyler i Hardy-snella og backingen forsvinner ut i et urovekkende tempo. Slampen av en fisk går mot brekket, der elva deler seg. Pokker! Jeg bremser det jeg er kar om, og heldigvis stopper fisken et par meter ned i strykene i det borteste løpet. Hvorfor, skjønner jeg i grunnen ikke, men jeg skal jo bare være glad for at den ombestemte seg. Noen meter til og jeg hadde garantert mistet den… Nå får det nok en gang briste eller bære, og jeg legger et maksimalt press på laksen. Heldigvis siger den i min retning og inn i hølen igjen. Dagen fortsetter som den begynte. 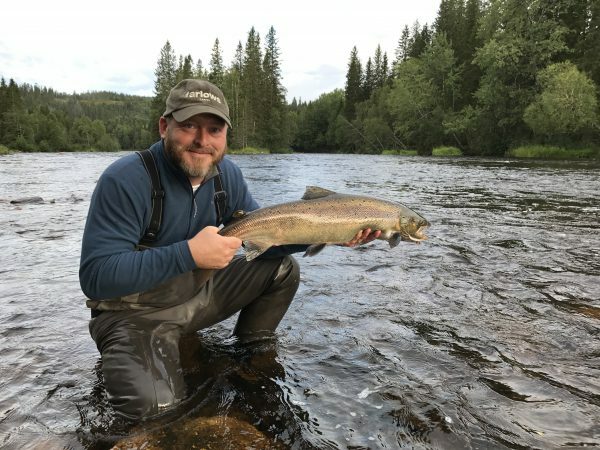 Øystein tar en ny laks, denne gangen i Hjelkdalen, og jeg opplever et fabelaktig fiske ved bjørka. En laks tar langt nede i hølen. Jeg kjenner bare et kort drag, før fisken kroker seg selv. 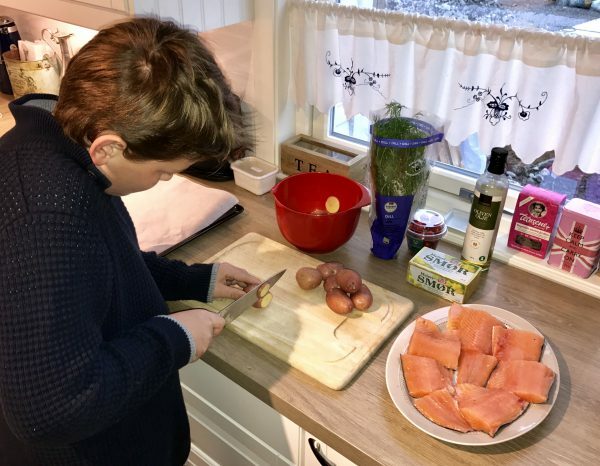 Jeg roper på Martin, som foreløpig ikke har landet fisk, og gir stanga til ham. Det er en fin fisk, som fremdeles har krefter igjen da Martin kommer løpende. Han får noen artige minutter, før jeg kan håve den drøyt fire kilo tunge laksen, som blir med Martin hjem til Skien. Men det er ikke over ennå. Det blir ytterligere tre laks på henholdsvis 0,8, 2,8 og 5,6 kilo, i tillegg til en jeg mistet relativt fort. Et eventyr, rett og slett, og da regnet tiltar i intensitet på ettermiddagen, gjør det absolutt ingenting å henge vaderne til tørk og tilbringe de siste timene ved bålpanna. 19 august våkner vi som ventet til flom. Men likevel har ikke elva steget så mye som fryktet. Jeg hadde egentlig slått fra meg å fiske i dag, men nå ser situasjonen annerledes ut. Vi har en lang hjemtur foran oss, men et par, tre timers utsettelse tåler vi. Riktignok er de fleste hølene vel raske. 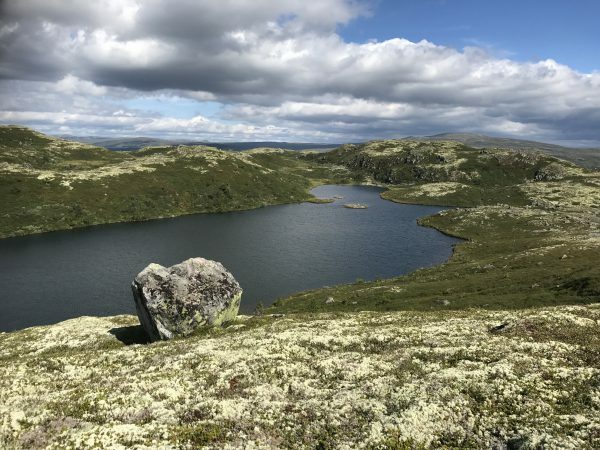 Vannet fosser forbi bjørka, gjennom hølen nedenfor campen, videre til Besa og ned mot Hjelkdalen. Stilla og Øverhøla, derimot, virker lovende. Vi har knapt fisket der de siste dagene, men nå står de frem som ordentlige hotspots. Dette ble den siste fisken vi fikk på årets Søraå-tur. Jeg aldri opplevd et slikt fantastisk laksefiske tidligere og kanskje får jeg aldri oppleve noe tilsvarende igjen. Så dette skal jeg leve lenge på – og jeg gleder meg allerede til neste års tur til Raaum. Eller Kayland som vi bare kaller det nå. Fjellet var raust med oss i sommer. Dyveke og jeg hadde noen fantastiske dager – helt alene – i om lag 1200 meters høyde. Selv om det var ekstremt tørt, sviktet ikke det lille vannet jeg har fisket siden jeg var liten, denne gangen heller. Det ble noen fine panneørreter, alle tok en bibio-imitasjon. Lite vann, plenty fisk, oppsummerer i grunnen mine tre dager i Surna. 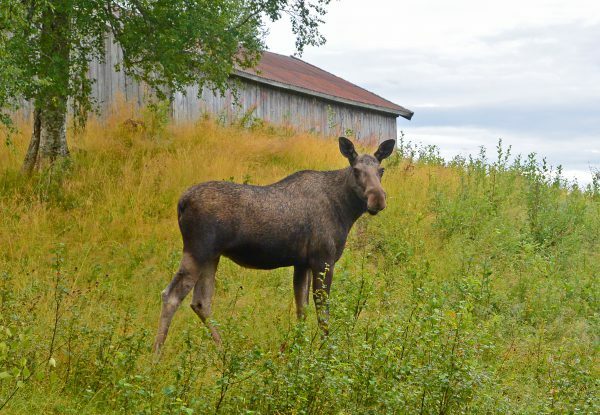 Var borti en laks i Mogstadhølen, ellers maktet jeg ikke å irritere noen av dem i tilstrekkelig grad. Men for all del: Med slike morgener klager jeg ikke. Satser på bedre lykke neste gang.